The VIRTESS 420 COUPE is of course a true COUPE motor yacht – yet the COUPE roof has a real saloon area where you can not only relax, but from where you can also for example control the music system – just one of many smart details on board the VIRTESS 420 COUPE. Or perhaps you would rather stretch out in the sun on the large (2 x 2 m) sun deck on the bow? The VIRTESS 420 COUPE – designed for luxurious hours at sea. Optimal view on the instruments at the helmstation. 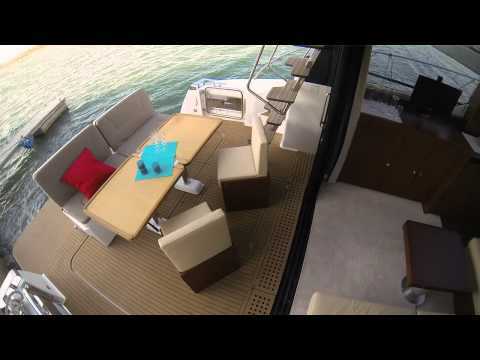 An innovative track system for tables and benches on the aft deck. An ingenious lighting concept creates a uniquely pleasant touch of life in all the spaces on board the VIRTESS 420 COUPE. The large sliding door to the cockpit not only allows a perfect 360‐degree view of the entire VIRTESS 420 COUPE, it also combines the cockpit and large salon to form one unit. Like the VIRTESS 420 FLY, the VIRTESS 420 COUPE has three cabins and a spacious saloon. From the moment when you are controlling the VIRTESS 420 COUPE’s powerful drives with a few small movements of the joystick to steer her out of the marina, you realise just how precisely a VIRTESS can be manoeuvred. Once you have passed the breakwater and unleashed the full power of the engines on a VIRTESS 420 COUPE, the ride is quite an experience.